WOMEX Community - News From The Road. This week has seen the WOMEX team in various cities across the Northern Hemisphere. 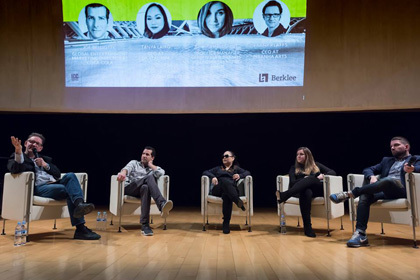 Our Piranha Arts CEO Frank Klaffs, is in Spain, participating in the panel discussion 'The Music Scene of 2020',talking trends in the future of music- for the Spring Career Seminar,a three-day boot camp focused on professional development at the Berklee College of Music - Valencia Campus. Director of Consultancy & Special Projects, Christine Semba,visits Eurosonic Noorderslag in Groningen, the Netherlands. While WOMEX Director, Alexander Walter, headed to New York City for globalFEST and the first annual globalFEST awards. Congratulations to the winners for their significant and longstanding contributions to the performing arts landscape in the USA. Piranha Records artist Thomas Mapfumowho, previous WOMEX sumurai, Michael Orlove and special tribute to the much loved and deeply missed Alexandra Nova who has been posthumously awarded the gFTrouble Worldwide Award.